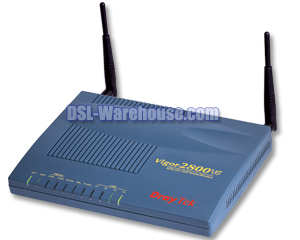 Draytek Vigor 2800VG ADSL 2/2+ 108Mbps Wireless Router w/VoIP has been discontinued. 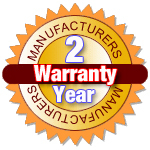 CLICK HERE to go to the replacement product. The DrayTek Vigor2800VG is a combined Voice Over IP ADSL router for Internet access, firewall, VPN device and Ethernet switch. The DrayTek Vigor Vigor2800VG includes features such as VLAN, QoS, Content filtering, VPN support for up to 32 tunnels and a USB printer port and support for all current ADSL technologies. 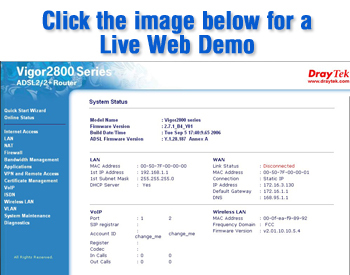 The DrayTek Vigor 2800VG supports selectable QoS (Quality of Service). 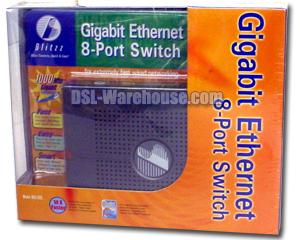 This enables you to select specific protocols/services to have guaranteed levels of your Internet bandwidth. For example, if you need POP3 email to have priority, you could specify that 50% of your download (or upload, or both) bandwidth is reserved for POP3 when required. When it's not being used by POP3, the bandwidth is available for all other traffic. The DrayTek Vigor2800VG is very flexible on QoS - you can set several groups of services to have different priorities and bandwidth reservations. Voice-over IP (VoIP), is one of the hottest communications technologies being adapted for transmission over broadband technologies. If you regularly make long-distance phone calls, chances are you've already used IP telephony without even knowing it. VoIP is the transmission of telephone calls over a data network like one of the many networks that make up the Internet. While you may of heard of VoIP, what you may not know is that many traditional telephone companies are already using it in the connections between their regional offices. The DrayTek 2800VG allows a simple, cost-effective solution to take advantage of this exicting technology. The Draytek Vigor 2800VG includes full packet-level firewall facilities, not just the inherrent 'NAT' security and port-blocking of other routers. 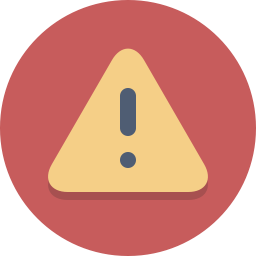 This includes 'keep state' packet methods; put simply, this means that when a packet is sent out, a reciprocal record is kept to allow a packet coming back in the opposite direction, but a default 'deny' policy means that any packet arriving which appears unsolicited won't get through. The DrayTek Vigor 2800VG also features automatic protection from Dos/DDos (Denial of Service/Distributed Denial of Service) attacks and IP anti-spoofing. User-definable filters also allow you to add additional protection to your connection. For added confidence, potential or foiled attacks are logged and can be reported via the router's syslog facility. The Draytek Vigor 2800VG 32 Tunnel VPN Engine enables you to connect your network (LAN) to another private network, via the public Internet, or for remote teleworkers to access your LAN securely via the Internet. A secure 'tunnel' is established and as you are making use of an existing Internet connection, there are no long distance phone charges or huge leased line costs typical of LAN links. 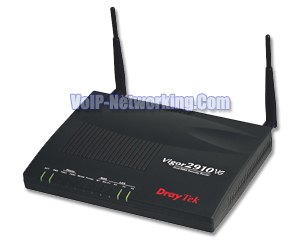 The Draytek Vigor 2800VG supports industry standard PPTP and IPSec VPN protocols, with DES/3DES encryption. Each VPN tunnel can route to multiple private subnets at the remote site.